After a long hard week of driving Gertrude, playing a few rounds of golf and visiting two wineries a day in the Niagara region I decided that Monday was a much needed rest day, and as such headed to the office and did not blog. Who would have thought that tasting wine and driving a classic Ferrari were such tiring activities? As I am starting to reflect back on the week, not the individual wines, I am finding that the week produced quite a few highlights and very few disappointments. All of which went to remind me how much the area has to offer and how nice it is to be a short hour to hour and half drive from it all. Speaking of experiences well on the positive side, it was Friday of last week that we headed over to St-David’s and visited both Ravine Vineyards and Château des Charmes, coming away from both experiences with great wine and memorable experiences. We will start with the Bosc family’s Pinot Noir. Paul Bosc is a graduate from the University of Burgundy and has been one of the leader’s of the Canadian wine industry since the late ’70s. So why is it we never truly associate Château des Charmes with burgundy style wines despite his solid regional training/education? It could be that, for all the wines that the Bosc’s put forward, Equuleus and Gamay Droit remain the foremost in most people’s minds. Odd for sure, especially for someone so accomplished in the nuances that are the pesky Pinot Noir and Chardonnay grapes. The wine we are discussing comes from the vineyard named for the very man himself, the Paul Bosc Vineyard. If you are travelling to the Château along St-David’s Road you are actually moving along the dividing line that separates the St-David’s Bench from the Paul Bosc Vineyard not just on paper but soil, sediment and climate wise. Many years back you could easily see this evidence when the winery produced two single vineyard Cabernet Sauvignons and today it is demonstrated best when comparing their two current Chardonnay’s from each vineyard. If you every get a chance, I highly recommend this micro lesson in terroir by driving over and tasting both Chards side by side. Sadly there is no St-David’s Bench Pinot Noir to compare this wine to, if there had been I may have had a mental breakdown from excitement (yes I am easy to please). Before we go into the tasting, I’d like to thank both Glen for his excellent presentations and knowledge; and Michelle for setting up the tastings, you both made the experience exceptional and continue to make me want to come back. On to the tasting! I decided not to decant the bottle at home as I remembered the bold, yet elegant, wine from the initial tasting being poured from a newly opened bottle. What came out was no different, a strong nose of pepper and black cherry presided over the deep ruby red colour. The first sips bring forward a mixture of plums, earthiness and red fruit. As you start to delve into the bottle more you will find hints of tobacco, more spice (again pepper came to mind) and bold red tree fruits. The tannins, while firm, are not overwhelming. The wine is well balanced from tip to finish and while the wine is drinking extremely well now I would expect this to continue to evolve over the next few years and produce a stunner come 2014-2016. Overall this is very much a Pinot Noir you can put against much higher priced Burgundy (or even Niagara) wines and it will hold it’s own. At $35 this is not inexpensive, but for the quality but it is priced low for other Niagara region top flight Pinot’s. It is difficult not to reward or upgrade the subjective rating based on the value and as such you will see a rating below that (as usual) demonstrates my view on quality, price and desirability. The CWG Subjective Rating is 90 out of 100. 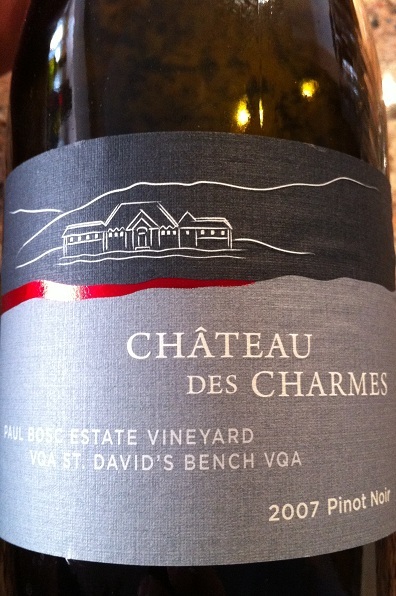 This entry was posted in Canadian, Wine and tagged canadian wine guy, chateau des charmes, wine review. Bookmark the permalink.